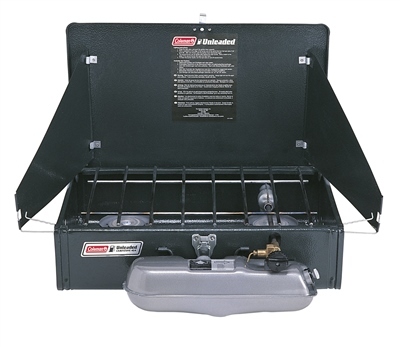 The Coleman® Unleaded 2-Burner Stove operates from Coleman® Liquid Fuel as well as unleaded petrol ensuring high performance even in cold temperatures and at altitude. Large, effective windshields protect the burners under windy conditions while the large pan support grid easily accommodates two large pans. It is the ideal appliance for a family or group camp, operating efficiently in colder conditions. When not in use, it conveniently packs into its self-contained carry case with a locking-latch to secure it for transport and storage. Strong, reliable and economical to run, the Coleman® Unleaded 2-Burner Stove is easy to use and built to stand the test of time. Iv`e had a coleman double burner for about 10 yrs now and its still going strong . totally reliable very powerful and easy to use , i just put some petrol in a can when i fill the car up before setting off on a trip , i would recomend one to anyone and am looking at buying a single burner for fishing. Camping & Leisure World, I have just come back off my 2 week camping holiday with my family of 5. The Coleman Premium Double Burner i recieved 3 days prior was a outstanding stove for my family and i cannot fault the product in any way. Thanks.